Email marketing frequency: How much is too much? Consumers are more receptive to email marketing than perhaps brands think, with highly active email users will tolerate up to an average of five messages per week before complaints start happening, according to new research. The study, from Return path suggests that marketers can send more messages without suppressing response, but not necessarily to users’ primary accounts. 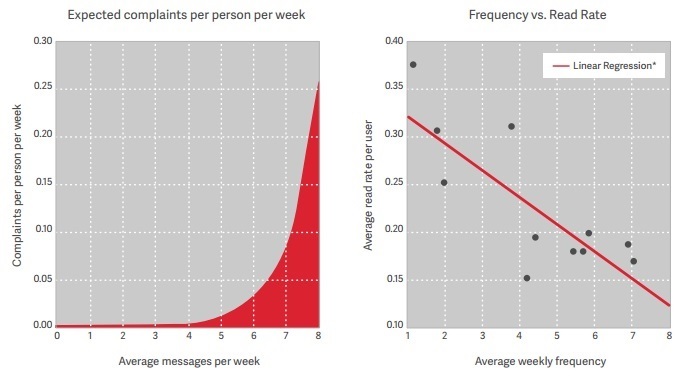 Return Path analysed the user behaviour of more than 600,000 users over a three-month period to identify the optimal sending frequency based on subscriber engagement. Findings suggest that every sender’s ‘magic number’ -- the frequency that generates maximum response without excessive complaints -- not only differs among brands, but differs dramatically based on account type. According to these results email marketers can send more frequently -- but not necessarily to people’s primary accounts. This analysis highlights a missed opportunity for many brands included in the study. Email marketers should employ more frequency testing to uncover their capacity to send and sell more. One key to optimising for frequency is segmenting by account type. Return Path identified three distinct groups based on users’ overall interaction with email: primary, secondary, and dead accounts. Primary accounts, the most actively checked, make up only 24% of all email accounts yet they represent 83% of all messages read. While primary users are highly engaged, they are also not shy in voicing their displeasure, accounting for half of total email complaints. As they represent the majority of reads as well as complaints, primary users are the key audience marketers should optimise their programs for -- albeit cautiously. These users are the best critics to market to as they won't hesitate to praise (read, click through) or criticise (complain, unsubscribe) any shifts in frequency. More tolerant were secondary account holders who interact with their mailboxes less often and represent fewer reads, but are less than half as likely as primary account holders to complain. These subscribers may represent a frequency test audience that marketers can approach less cautiously. To study consumer response to email marketing frequency, Return Path analysed subscriber engagement with more than 199 million messages delivered to the inboxes of more than 600,000 account holders between December 2014 to February 2015. Comparisons of frequencies’ influence on engagement were limited to account holders that received commercial messages from at least five senders. Primary, secondary, and dead account classifications were determined by account holders’ total activity within mailboxes.